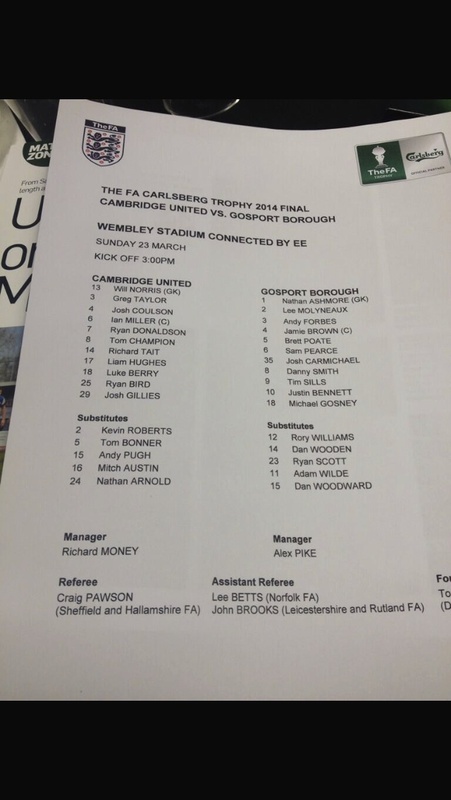 Cambridge United and Gosport Borough were both competing in their first ever Trophy finals, and on a pleasant afternoon at the “home of football,” it was the full time club’s quality that ultimately shone through. Myself and my colleague at Hampton & Richmond Borough Rob had been the lucky recipients of the club’s two complimentary tickets, and I certainly wasn’t going to pass up the chance to see the final. It realised one of my seasonal objectives (among the others are going to the Vase final and an England C game. At least one of those is still achievable!). I have been lucky enough to see my hometown club Huddersfield Town win playoff finals at old and new Wembley, but I’ve never been to a final where I haven’t supported one of the participants. The well produced and glossy souvenir programme cost just four pounds, but the soft drinks came in at almost the same price! Needless to say, I was there as a neutral, but both myself and Rob had a tendency toward the underdog – don’t we all? And as you can see from the photo above, the view we enjoyed was excellent. Conference South strugglers Gosport came into the final in the bottom three of the table, whilst their Premier opponents United are second only to runaway leaders Luton Town in non league’s top flight. Despite being heavily outnumbered, the Borough fans were in fine voice, and the atmosphere amongst the 18120 crowd was expectant and good natured on both sides of the ground. Gosport started brightly, with Justin Bennett having a couple of early efforts, while at the other end Luke Berry got beyond the Borough backline only to be denied by goalkeeper Nathan Ashmore. In a frenetic opening twenty minutes, both teams were showing no signs of fear on the big occasion, with Jamie Brown, Michael Gosney and Lee Molyneux all shooting straight at Will Norris, while Ashmore was called into action again to deny Berry. The best chance of the opening half hour fell to the Step Two side. Bennett hit a decent shot which Norris couldn’t hold, spilling the ball. He was relieved to see the ball fall to his skipper Ian Miller rather than a Gosport forward, and the danger was cleared. As the final five minutes of the half approached, Cambridge’s Liam Hughes had a freekick twenty yards out. However, both his initial effort and follow-up were blocked. United weren’t to be denied for long, though, and took the lead six minutes before the break. Ryan Bird – on loan from Gosport’s neighbours Portsmouth – lobbed a fine finish over Ashmore from fifteen yards. It was enough to give The U’s an interval lead, but it was harsh on Gosport who had more than matched their higher level opponents. During the interval, Rob said he felt the next goal was crucial, while I said I thought Cambridge would now go on and grab a quick second before going on to win 4-0. I did. Honestly! As it turns out, of course, I was spot on. Ryan Donaldson got the second just five minutes into the half, calmly rounding Ashmore and slotting home after latching onto Bird’s through ball. And seven minutes later, the result was put beyond doubt as Donaldson grabbed his second, controlling the ball and lashing home after an almighty goalmouth scramble during which Hughes had hit the post. Gosport didn’t let their effort drop, and by now were looking for a souvenir goal for their supporters to cheer. Michael Gosney had a gilt edged opportunity to get that goal, but he shot tamely at Norris. Justin Bennett had the Hampshire side’s best chance of the match with seventeen minutes left, turning well in the box before shooting agonisingly wide. By now, Cambridge’s full time fitness was starting to show, and they continued to search for a fourth. Substitute Nathan Arnold skinned Molyneux before seemingly putting the ball on a plate for Bird to tap in. However, Adrian Forbes had other ideas and made a stunning saving tackle. Alas, seconds later it was 4-0. Sam Pearce fouled Andy Pugh, leaving referee Craig Pawson with an easy decision. Luke Berry stepped up and sent Ashmore the wrong way, and the Cambridge fans into raptures. Gosport did have one last effort on goal, and it would have been some strike had it gone in. Dan Woodward hit a shot with the outside of his right foot from the right corner of the penalty area. Will Norris could only watch and pray as it clipped the top of the bar and went over. 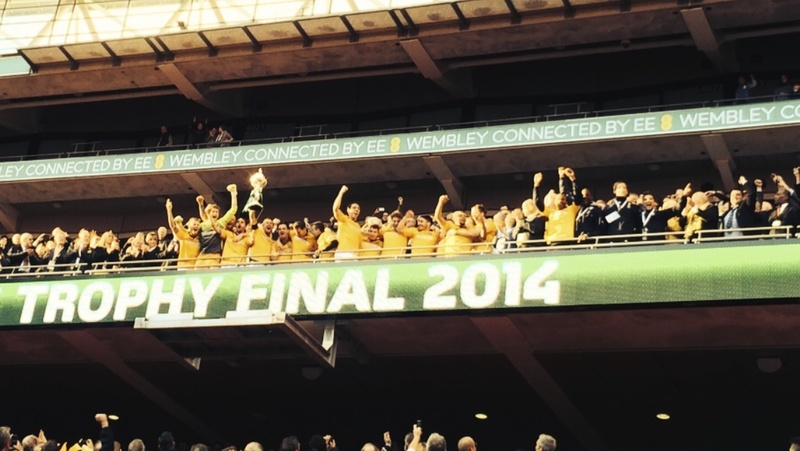 It would have been a lovely moment for the team and their fans, and no less than they deserved on the day. Unfortunately for them, they just ran out of steam against a superior opponent. Everyone associated with Gosport Borough can be very proud of the club, and hopefully they can build on this in their fight against the drop. 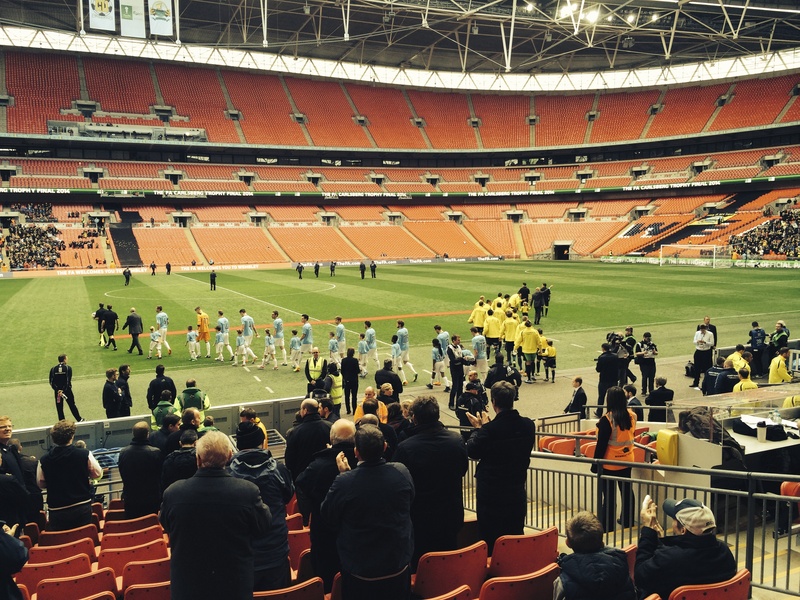 For Cambridge United, this day out at Wembley will give them a taste for the Capital, and they will be eager to return in the playoff final in May. And for manager Richard Money, he might get to lift a trophy he actually wants!